the problems with Illegal logging. Illegal logging negatively impacts the economic and ecological systems of optimal forest management. According to the text of the 1998 G-8 meeting held in Birmingham on forest management, “illegal logging robs national and subnational governments, forest owners and local communities of significant revenues and benefits, damages forest ecosystems, distorts timber markets and forest resource assessments and acts as a disincentive to sustainable forest management. International trade in illegally harvested timber including transfer pricing, under invoicing and other illegal practices, exacerbates the problem of illegal logging.” The magnitude of illegal logging is significant. Research indicates that in the recent past over 70 per cent of timber processed in Indonesia came from illegal sources. 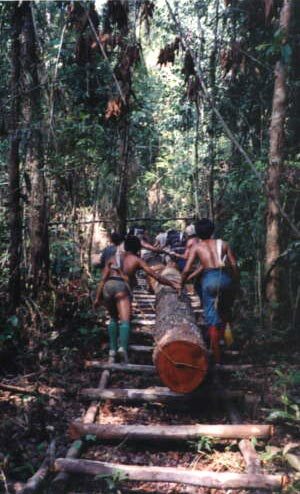 Illegal logging is not as prevalent as it was during the 1980s and 90s although it still occurs. Illegal logging generally focuses on high-value species and results in a selective clearing of certain species. These are often large, long lived, seed producing trees. As a result of this selective illegal logging certain endemic species are depleted from forests. This is now the case in most of Kalimantan’s remaining forests. This loss of certain structural, habitat, and seed source elements leave forests less stable and productive. Although these species may not be fruit or food producing sources for orangutans they are important as nest trees and provide linkages within the upper canopy where orangutans move. Other results of illegal logging involve the intrusion into the forest caused by loggers. Often canals and trails are cut to allow foot and boat access deep into the forest. Canals result in lowered water levels and increased human access into forests increase incidents of illegal hunting and other destruction of habitat.